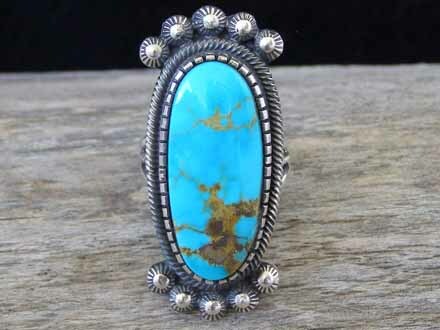 This ring by Navajo silversmith Leon Martinez is set with an oval of Kingman turquoise in a notched bezel wrapped with twisted square wire and decorated by arcs of starred buttons above and below the stone. The shank consists of two lengths of round wire with a length of twisted square wire sandwiched in the middle. These lengths of wire split into individual bands before attaching to the ring back. Hallmarked Leon Mtz and stamped Sterling on the ring back. Stone: 1 3/16" x 9/16"
Ring face: 1 3/4" x 5/8"